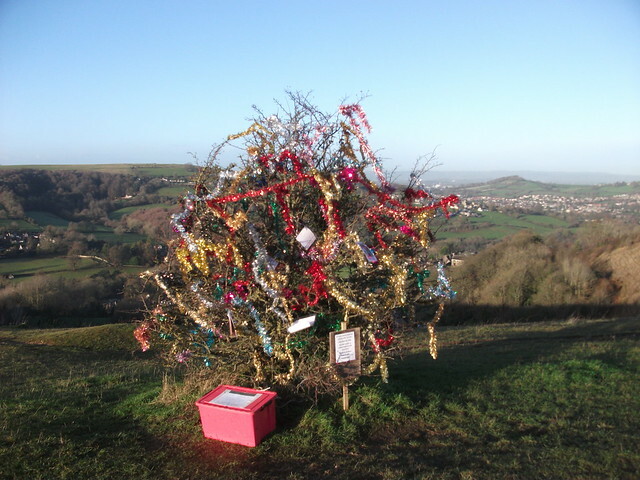 Once upon a time somebody had the idea of decorating a little thorn tree on the top of the hill every year for christmas. Each year decorations and cards from the local dog-walkers would arrive. 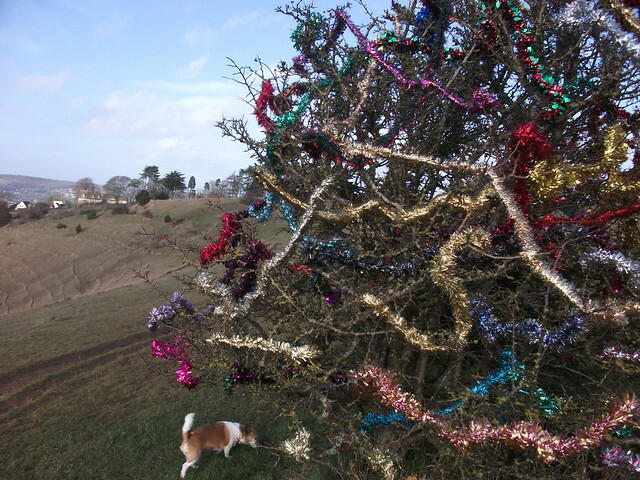 The spiky thorns would valiantly hold on to the decorations in the blustery wind, and on a sunny day the tinsel would billow and sparkle in the sunlight. 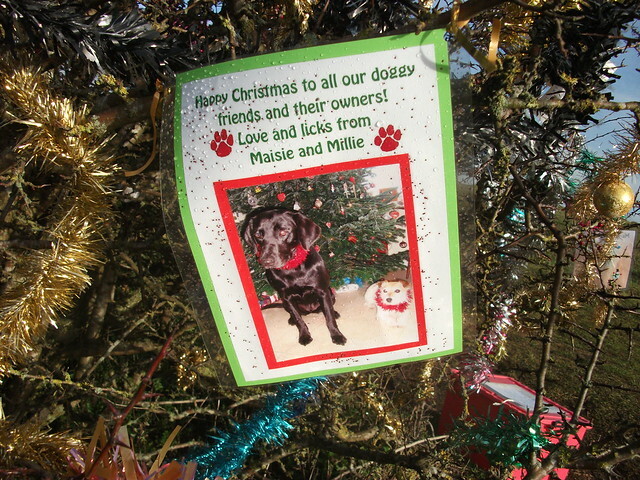 and perhaps an idea formed to leave a box underneath the tree for donations of food and money for the local dogs home. and wouldn't that be a great idea. 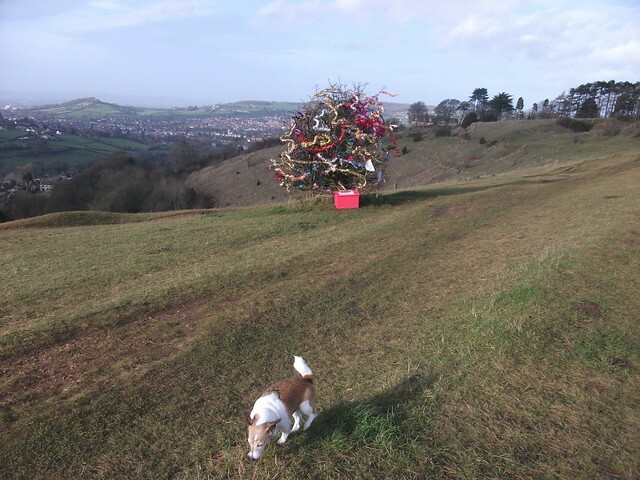 For at christmas many local folks make the pilgrimage here to see the tree in all it's glory gently billowing and sparkling in the breeze. To leave a little something in the box, (which is emptied daily by kind doggy folk). and we call it doggy heaven up here, because of course it is. funny little messages and pictures. So if your ever in Gloucestershire or hereabouts at christmas you know to make the journey here and share the doggy love. 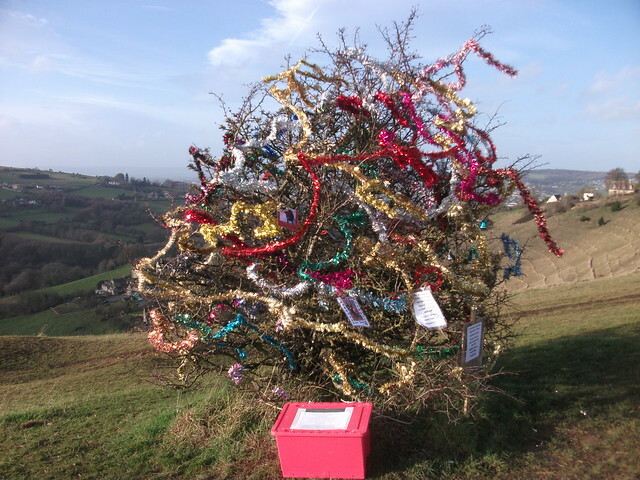 Now I did a little research and it turns out that there has been the tradition of decorating another famous thorn tree called the Glastonbury thorn, which some of you may have heard of. This tree at Glastonbury is said to have been there for 2000 years. According to legend it is said to have originated from a wooden staff which Joseph of Arimathec thrust in the ground after travelling here from the crucifixion of Jesus. The next morning a small bush was said to have grown. A special Hawthorne tree grew which famously flowered on christmas day and easter. This tree became a natural shrine. Each year some sprigs were cut from the tree and sent to the queen for her to put on her festive table. 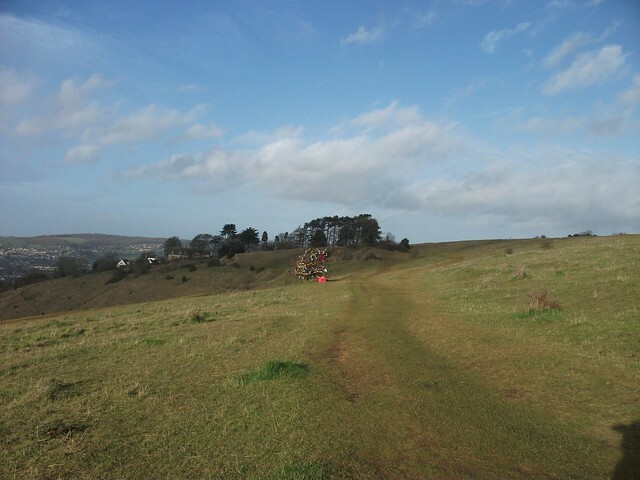 Sadly in 2012 vandals cut down the tree! 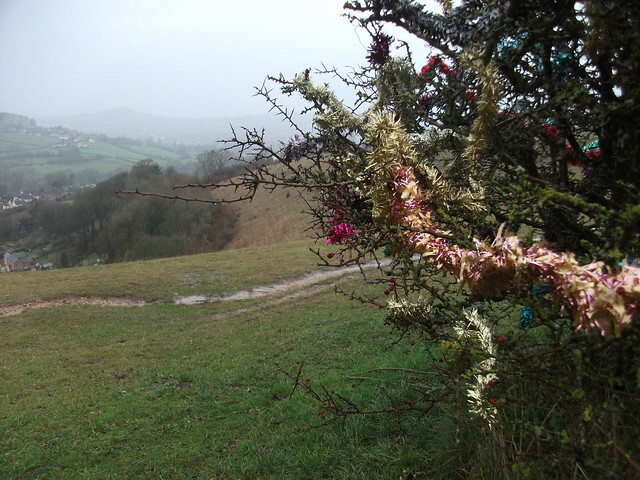 But it has now been replaced by another tree grown from a cutting of the original tree which was safeguarded by taking cuttings and grown in special places around Glastonbury. And they have tested this tree and it does actually show that it does come from a species in Israel! 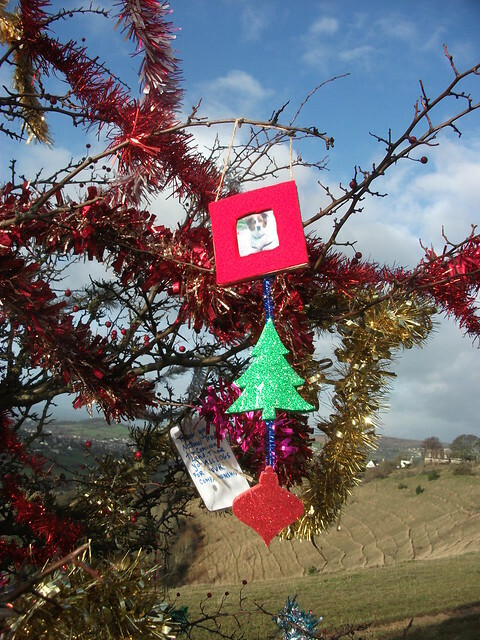 and so we have our special tree in Gloucestershire, which we hope vandals will not cut down! perhaps i should take a cutting! 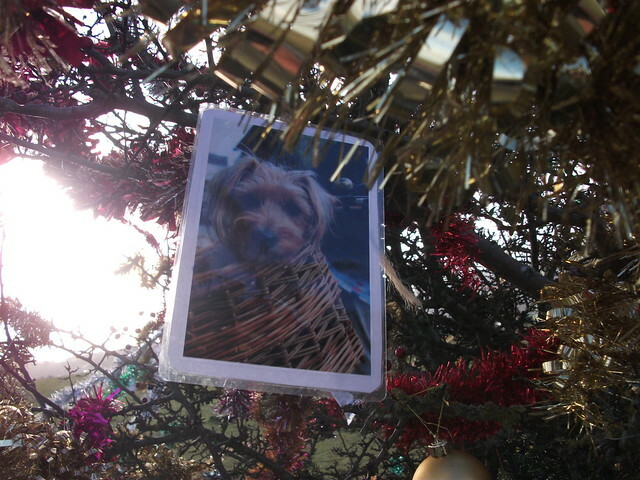 so from the common and the dog-walkers christmas tree I wish you and yours a very merry christmas! have a lovely day. I hope the skies are bright clear. As you know, I really love this tradition of your little thorn tree!!!!! I love all your pics taken while you are leaving that happy tree…. How absolutely lovely and what a gorgeous historical tale to go with it. It must be a joy to brighten the darker days of the year. It's a wonderful story Heather, all about wonderful people and their beautiful four-legged friends, thank you! Wishing you and your son the very best Christmas filled with peace, love, and joyfulness! A lovely idea and a lovely post. Merry Christmas to you and your boy. What a lovely idea....thanks for showing this. 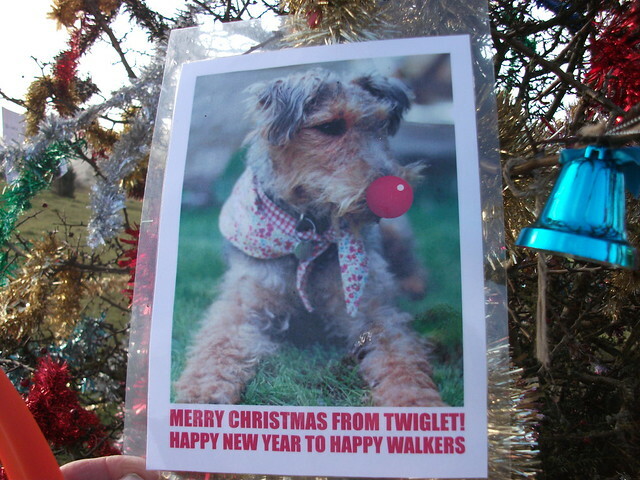 Hi Heather.....Merry Christmas and warm wishes for 2014.
anywhere that celebrates the joy of Christmas with a dog walkers tree sounds like a wonderful, magical place to live! thank you for sharing this lovely tradition.